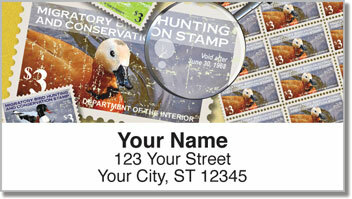 Duck stamps are a unique tradition carried on by the U.S. Postal Service that began back in 1934. 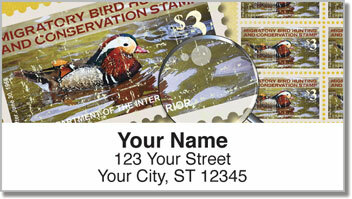 That's when the first artist sketched a mallard duck to be used on a postage stamp. Since then, a wide variety of waterfowl have been featured on stamps, and they've been used to support the National Wildlife Refuge System. 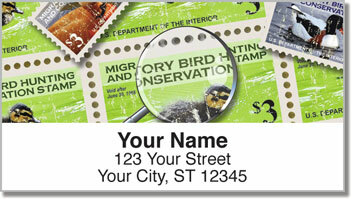 Whether you are a stamp collector, duck hunter or nature lover - these labels are a great way to top off letters and packages. Plus, you'll be pleasantly surprised at how convenient they are. Just peel and place one of your new address labels on all that outgoing mail using the handy self-adhesive backing. No licking and sticking. No scribbling out your name and address by hand. 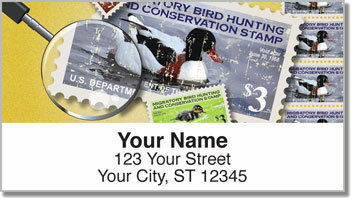 Get your very own Duck Stamp Address Labels right now! You can also add a set of matching personal checks.